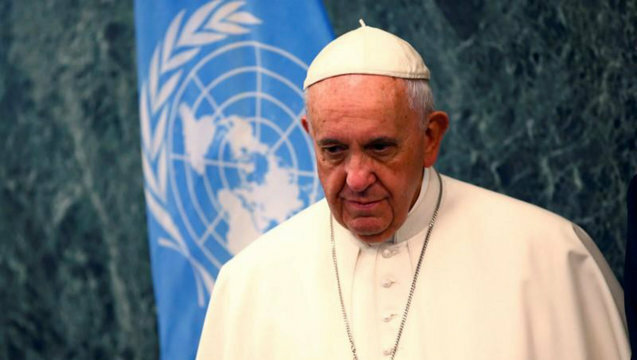 DN: Pope Francis Speech to UN: Greed for Wealth and Power Cause Suffering for Poor, Climate Crisis – Engage! The ecological crisis, and the large-scale destruction of biodiversity, can threaten the very existence of the human species. The baneful consequences of an irresponsible mismanagement of the global economy, guided only by ambition for wealth and power, must serve as a summons to a forthright reflection on man: “man is not only a freedom which he creates for himself. Man does not create himself. He is spirit and will, but also nature” (BENEDICTXVI, Address to the Bundestag, 22 September 2011, cited in Laudato Si’, 6). Creation is compromised “where we ourselves have the final word… The misuse of creation begins when we no longer recognize any instance above ourselves, when we see nothing else but ourselves” (ID. Address to the Clergy of the Diocese of Bolzano-Bressanone, 6 August 2008, cited ibid.). Consequently, the defence of the environment and the fight against exclusion demand that we recognize a moral law written into human nature itself, one which includes the natural difference between man and woman (cf. Laudato Si’, 155), and absolute respect for life in all its stages and dimensions (cf. ibid., 123, 136).